Circa's Opus. Photo: Justin Nicholas, Atmosphere Photography. Is there a place for acrobatic content in dance? Nina Levy offers her thoughts. BACK in the February/March ’16 edition of Dance Australia, we ran a story entitled “The acro invasion” by editor Karen van Ulzen, raising concerns about the rise of acrobatic and contortionist content in amateur dance competitions. The argument against this trend, says van Ulzen, is two-fold. She points to a reported rise in injuries normally associated with tumbling or overstretching as one concern. The other issue, she says, is that teachers are replacing choreography with acrobatic stunts. She argues that while dance is an art form, gymnastics and acrobatics are “displays of physical strength and flexibility”. The article, which was also published online in May, drew a lot of feedback from readers. While some wrote that they agreed wholeheartedly with the concern that dance competitions are becoming a display of acrobatic ability, a number of circus artists, aerialists and teachers of acrobatics expressed their dismay at the assertion that dance and acrobatics are separate entities, occupying opposite ends of a spectrum that has “art” at one end and “sport” at another. So what is the relationship between dance and acrobatics? Stepping outside the context of the original article - the world of amateur competitive dance - we see that, historically, crossover between dance and acrobatics has taken place in popular dance. By comparsion, at a glance it appears that ballet and acrobatics have little to do with each other. After all, classical ballet is manifestly “upright”. The closest a ballerina gets to being upside down is a penché and at no point do the hands touch the floor, much less take weight. Perhaps the closest classical ballet gets to anything approaching the world of acrobatics is when ballerinas are “flown” in on wires. If we dig just a little less deep into the past, however, we find that the lines are not so clearly demarcated. As early as the 1920s the choreographers of Diaghilev’s Ballets Russes were redefining ballet, stretching its capabilities and definitions. Bronislava Nijinska was incorporating acrobatic elements into works such as Les Noches (1923) and Le Train Bleu (1924). Influenced by the Russian constructivists, she was interested in the geometric forms that the body could create. In 1929, the young George Balanchine’s Prodigal Son incorporated human pyramids, bodies linked together caterpillar-style, and pas de deux that saw the female dancer use the male as a climbing frame. Geon van der Wyst and Paula Baird Colt in Meryl Tankard's The Deep End, created for the Australian Ballet in 1996. Fast-forward to Australia at the end of the 20th century and we find Meryl Tankard putting dancers of the Australian Ballet on bungee cords for her 1996 work The Deep End. Who can forget that moment when three scuba divers sail out of the darkness and over the heads of the surprised and delighted audience? Tankard shows us that the balletic space can be truly three-dimensional. When it comes to contemporary dance, at least in theory, anything goes. Unlike ballet, which takes as its starting point a strict set of rules, contemporary dance, as the name suggests, is about finding new ways to move the body. So it’s no surprise that many contemporary choreographers utilise elements of acrobatic and aerial technique. Dancer/ choreographer and physical performer Claudia Alessi says that many Australians who started the trend of what she refers to as "ballistic dance movement" in the 1990s were influenced by Belgian choreographer Wim Vandekeybus. "At the same time people like Gavin Webber (also influenced by Vandekeybus) were dancing with Tankard and placing this new found language into her works," she says. "As artistic director first of her own company in Canberra and later Australian Dance Theatre (ADT), Meryl employed dancers from New Zealand who had great teachers and choreographers like Douglas Wright, a gymnastically trained dancer who was interested in exploring high velocity dance and acrobatic moves and shifts in style. In one scene, an aerialist manipulates a set of straps, the twisting action of his body through space echoing the winding sounds of the musicians who gather around him. "These influences then trickled down to Garry Stewart and Thwack!, a company he founded in Sydney in the mid 90’s. Thwack! was made up of dancers and ex-gymnasts such as Sarah-Jayne Howard, Craig Bary, Raewyn Hill, Ryan Lowe, Luke Smiles, me... and later on Antony Hamilton, Narelle Benjamin, Anton, Larissa McGowan and Lina Limosani. We'd spend hours in a gymnasium in the foam pit creating, discovering, throwing ourselves and each other around inventing ballistic dance and naming it - claiming it as our own... Garry went on to direct ADT, post Meryl's time as AD, taking the concepts we’d developed to the next level in production. Garry continued to be inspired by acrobatics, breakdance and ballistic movement that could integrate into dance." ADT dancers Matte Roffe, Zoe Dunwoodie, Thomas Bradley, Samantha Hines and Kimball Wong in Garry Stewart's Habitus. Photo: Chris Herzfeld, Camlight Productions. These days some of the best-known examples of works that integrate acrobatic content into dance come from Garry Stewart’s creations for ADT, which often require his dancers to perform movements that are aerobatic in nature. Stewart’s work and aesthetic has influenced a generation of dance-makers. So while the use of acrobatics in competitive dance may have a jarring effect if not well choreographed, in the broader world of professional dance, there is a long-standing tradition of incorporating acrobatic and aerial elements into dance in a way that is visually and thematically successful from an artistic perspective. Beyond the dance sector, acrobatics exists as an artistic genre in its own right. Globally, there are many contemporary circus companies presenting artistic works that take acrobatic and/ or aerial skills as a starting point and use what we might consider to be techniques from contemporary dance and choreography to weave these skills together. Brisbane’s Circa is one such company. Its 2013 work Opus is an excellent example of the genre, combining circus acrobatics, dance and four live musicians who roam the stage playing three of Shostakovich’s string quartets. In one scene, an aerialist manipulates a set of straps, the twisting action of his body through space echoing the winding sounds of the musicians who gather around him. In another, human stepping stones are accompanied by notes that trickle like water. A third scene has a Charleston feel as the performers whirl their hoops, their feet turning in and out. Opus is a seamless blend of acrobatics, music and dance. Listening to Williams talking about issues like safety, correct technique and artistic intent, we could just as easily be talking about the components of a dance training program. Read her article (opposite) and you’ll see the rigour and discipline that goes into training a circus or aerial performer. This article was first published in the December 2016/January 2017 issue of Dance Australia. Want more like this? 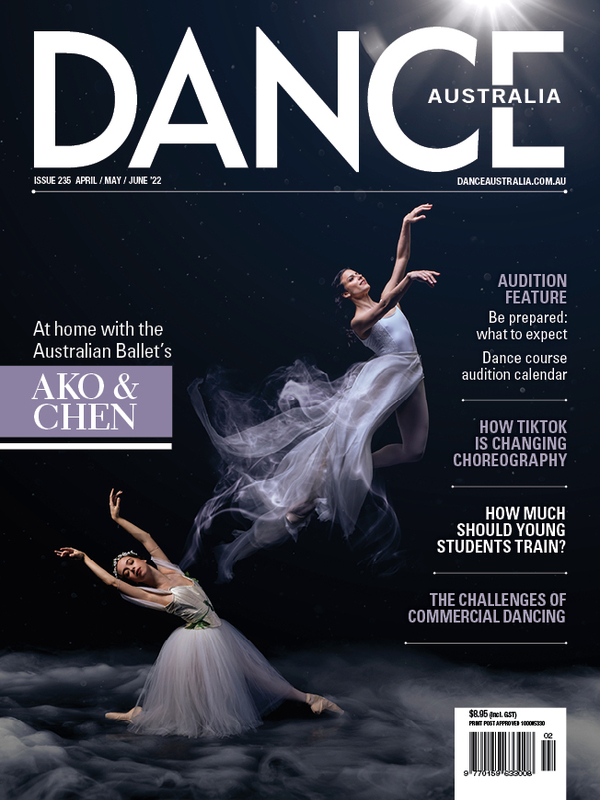 Buy Dance Australia at your favourite magazine retailer or subscribe here, or purchase an online copy via the Dance Australia app.